Coupe 156 Quadrifogrio...This is a virtual machine I imagined. 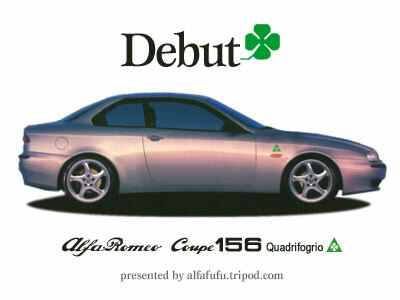 I don't know why Alfa Romeo didn't make 156 Coupe. But 156 with 2 doors is very nice looking. I think. Maybe greater than BMW E46 Coupe. I've modified whole body. Made front section longer, doors bigger, and rear section shorter. Alfa Romeo will release 156GTA this autumn, but I prefer Quadrifogrio. My wife had owned 145 Quadrifogrio before our marriage. And her 145's four leaves were very good looking. I also like the sound of "Quadrifogrio". So I've been imaging 156 Quadrifogrio since I've got 156V6. 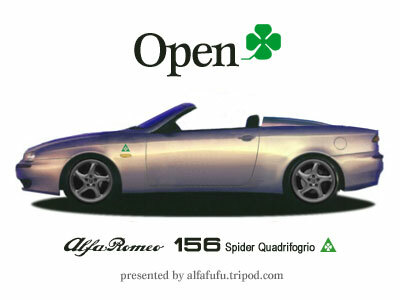 This time I've made some imaginary pictures of 156 Quadrifogrio. Please enjoy. This is Street Version of 156 Spider. I changed wheels into 19inch mesh type. And this body color is "Nuvora Purple" which I named. You may think that 156 with no roof looks too long... So I made Short body. But this looks like another car. Compact open air sport car. And no more Italian taste, almost like German car. I added small triangle window to get classical mood. And cut front window short. I like it. How were my imagenary cars? Do you like them?